In the "Java Web" category choose project of type "Web Application"
After the project is created, don't forget to right click on Libraries and add the Java EE 7 API Library to ensure that JavaServer Faces works properly. 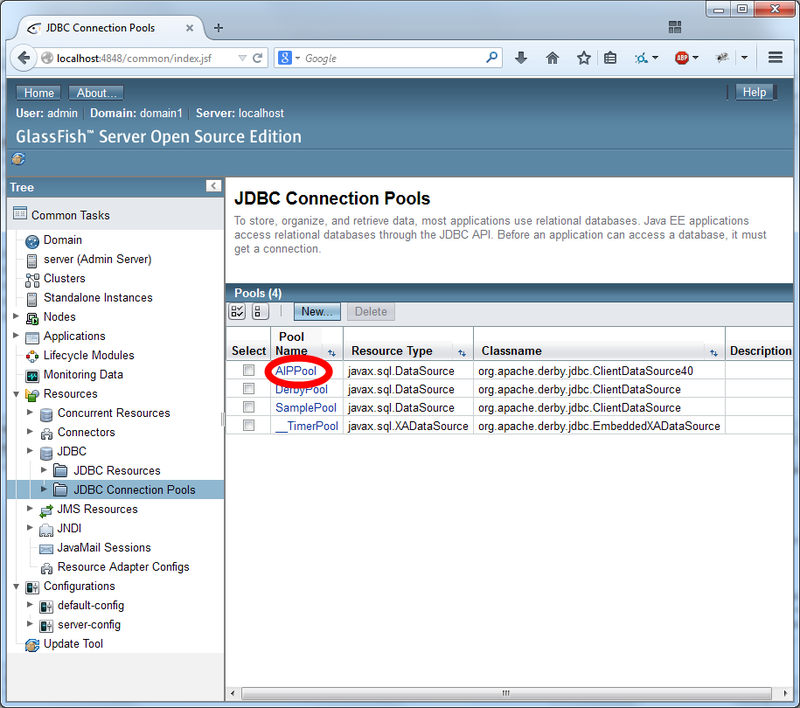 Please note that GlassFish 4.1.1 has a bug that prevents you from creating JDBC resources with the user interface. The best way to solve this problem is to upgrade to Payara. Full details can be found in the Hints. For this lab exercise, we will use Java DB. We first configure the database for use. 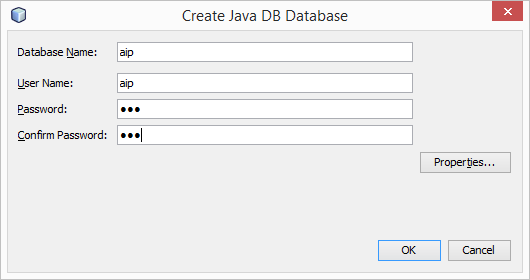 Go to the services tab, right click on Java DB and create a database. Name the database aip and set the username and password both to aip. In the "Other" category, add a new file of type "SQL file"
Name the file create_db (i.e., this creates a file named create_db.sql). The SQL file will not show up in the "Projects" tab. However, you can see it if you switch to the "Files" tab. Click on the "Run SQL" button to execute the file. It may ask which database to use. Select the database you just created: "jdbc:derby://locahost:1527/aip [aip on AIP]"
The result of the query should be a list of tables/views in the database. Even though you have not created any tables yourself, the database automatically creates metadata views. By querying these views, you can discover the structure of the database. If you would like to practice your SQL, you may use this file to experiment. Can you create a table? Query a table? Insert data? Drop a table? Update a row? Using the same SQL window, insert some sample data into your SQL file. Use an SQL "select" query to check that the data has been added to the table. You may like to also create a drop_db.sql file so that you can delete the database when you want to make changes to the schema. You can include "select" statements in your SQL file (or in another SQL file). The results will be shown in NetBeans. Strictly speaking, it isn't necessary to use SQL to create a database schema. 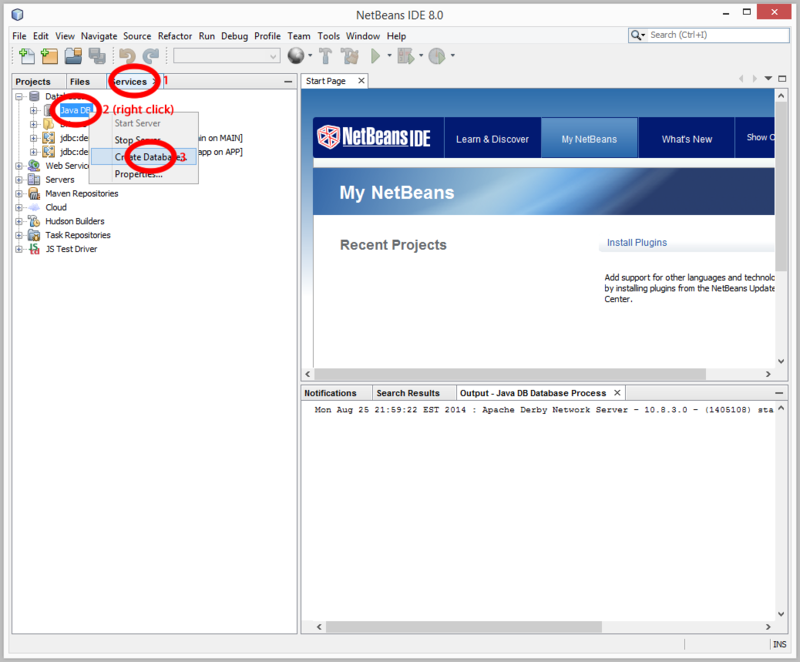 It is possible to create tables and insert rows using the NetBeans user interface (in the "Services" tab like when you first created the database). However, SQL files are easier to manage, check, and share with other users. For this exercise, you should create and populate your tables using SQL. In this exercise, you will query the database table that you just created. Create a JavaServer Faces file named "accounts" (i.e., accounts.xhtml). You'll need an import statement to be able to use Named and RequestScoped. It may seem counter-intuitive, but you should always use the one in the javax.enterprise.context package (not the one in javax.faces). There is a technical reason for this. There are actually two ways to create backing beans: an older approach built into Faces and a more modern approach based on Java's "CDI". 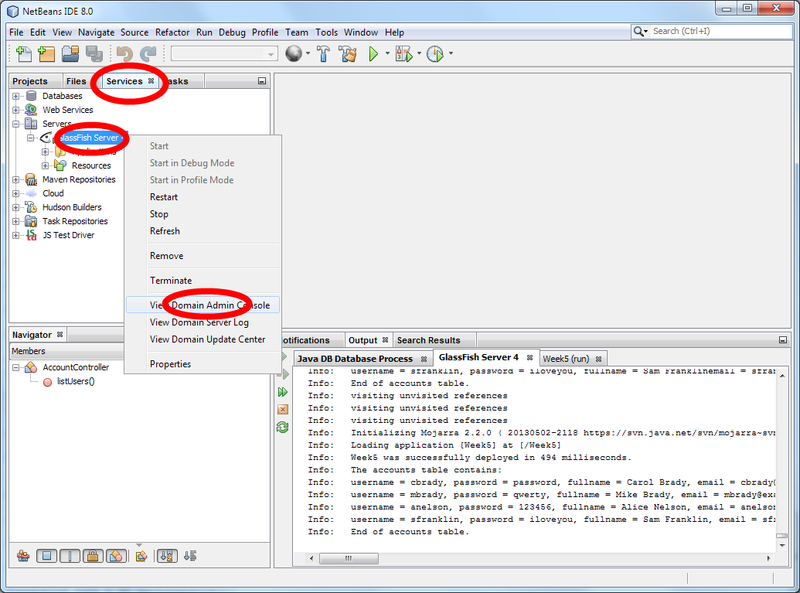 The javax.enterprise package is used by the more modern approach. The other package is used by the older method. Create a method in the AccountController named listUsers (it should take no parameters and return void). Add a h:commandButton to the JavaServer Faces page (accounts.xhtml) - you'll also need to put it inside a h:form. Configure the action of the commandButton so that when it is clicked, it will call the listUsers method. You're not doing anything special with JavaServer Faces. The command button is only being used to call the listUsers method. The listUsers method will output information to the server logs (nothing interesting will happen in the web-based user interface). Later on in this lab session, you will show the results directly in JavaServer Faces. Now, using the lecture notes and other references, modify the listUsers method so that it will output your database to the server log. Info:   Week5 was successfully deployed in 827 milliseconds. Info:   End of accounts table. How could the code be improved? In this exercise, we will configure and use container-managed connection pooling. 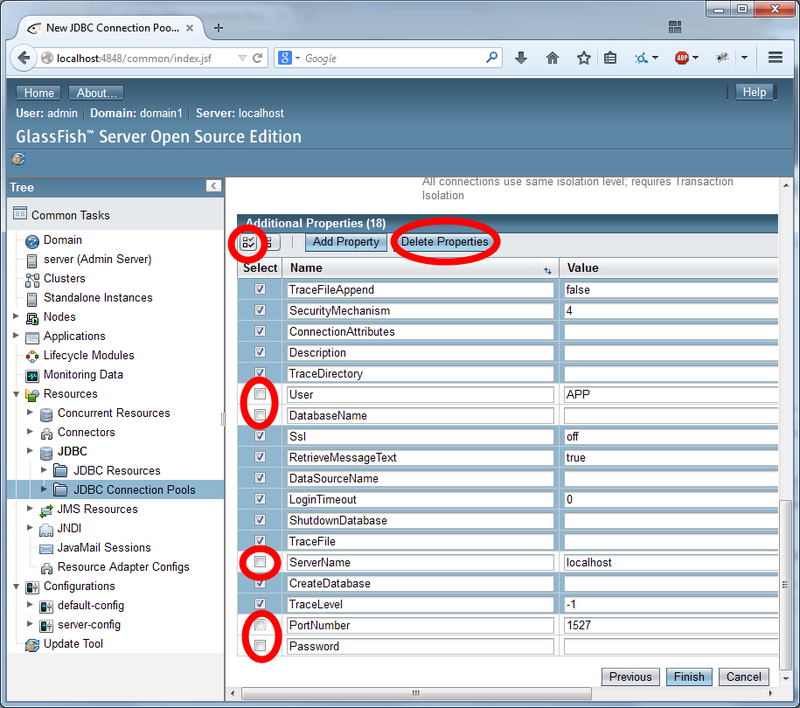 The GlassFish application server can be configured using XML files or the web-based Domain Administration Console. 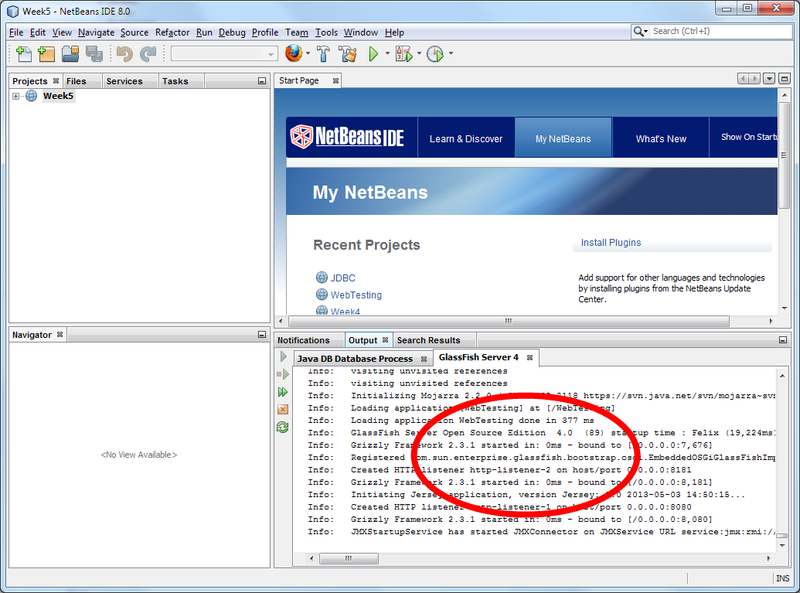 You'll find an option to launch the GlassFish Server Administration Console in the Services tab of NetBeans. If a username/password is required the default username is admin and the password is blank. 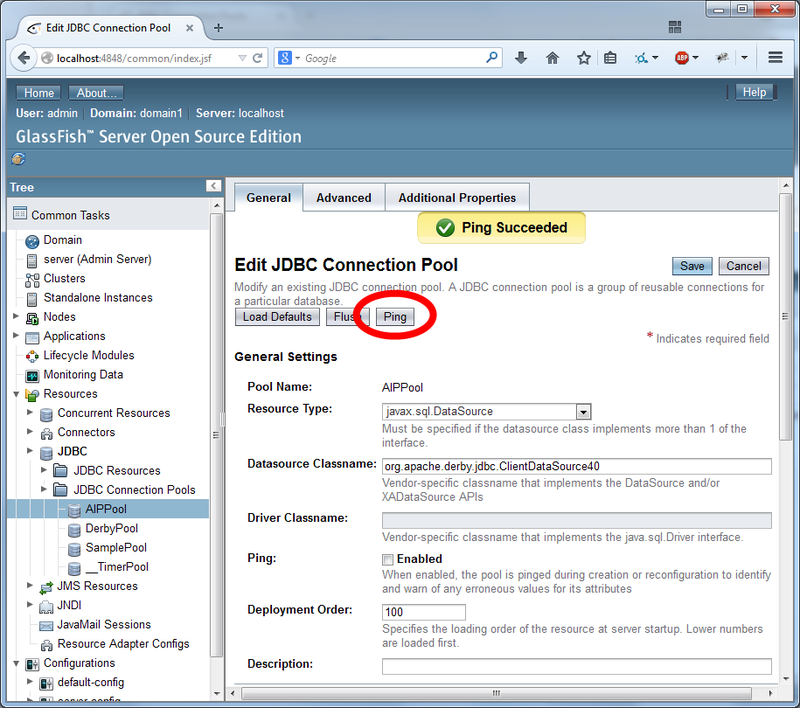 In the menu, locate "Resources/JDBC/JDBC Connection Pools" and create a new connection pool. Call it "AIPPool" and use the image below as a guide to configuring the pool. 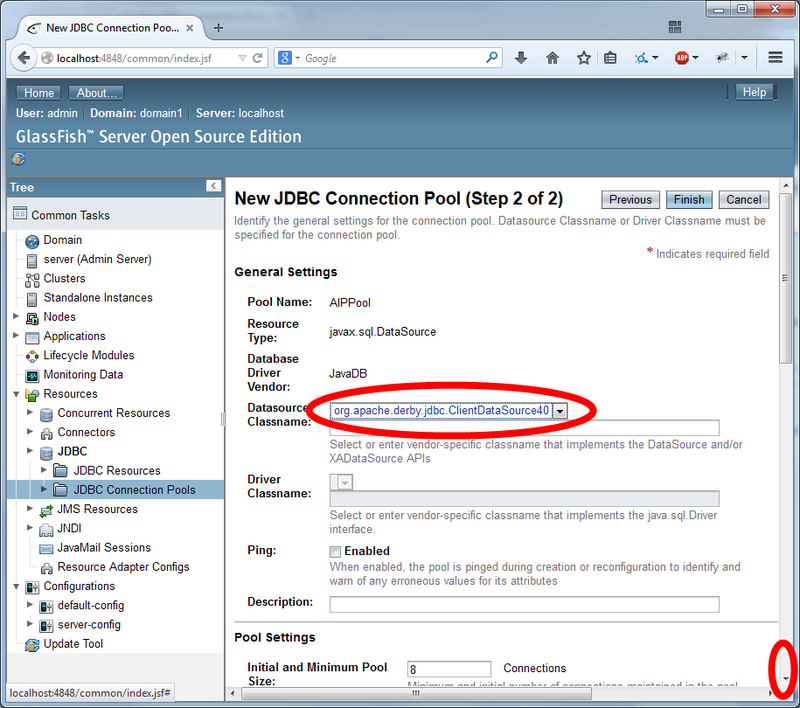 Select the datasource classname "org.apache.derby.jdbc.ClientDataSource40". Before clicking Finish, scroll down the page. At the bottom of the same page, remove all the "Additional Properties" except for: User, DatabaseName, Password, ServerName and PortNumber. Configure the properties as depicted in the image below. Click "Finish" to create the pool. Then click on "Ping". This will do a quick test to make sure that the connection works. Your connection pool is set up correctly if "Ping Succeeded" appears. Now that you have created a connection pool, you need to create a resource so that you can use it from within your code. 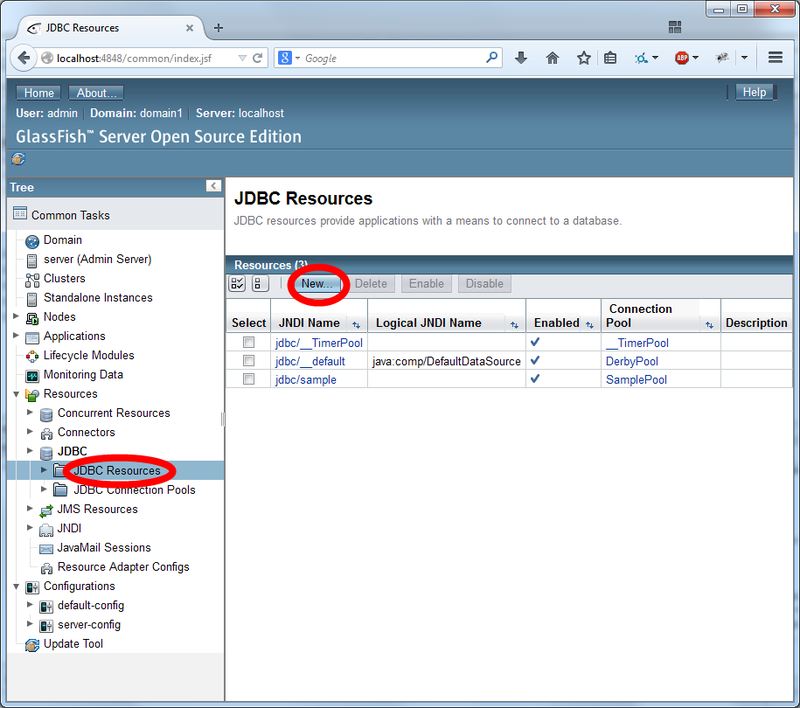 In the menu, locate "Resources/JDBC/JDBC Resources". 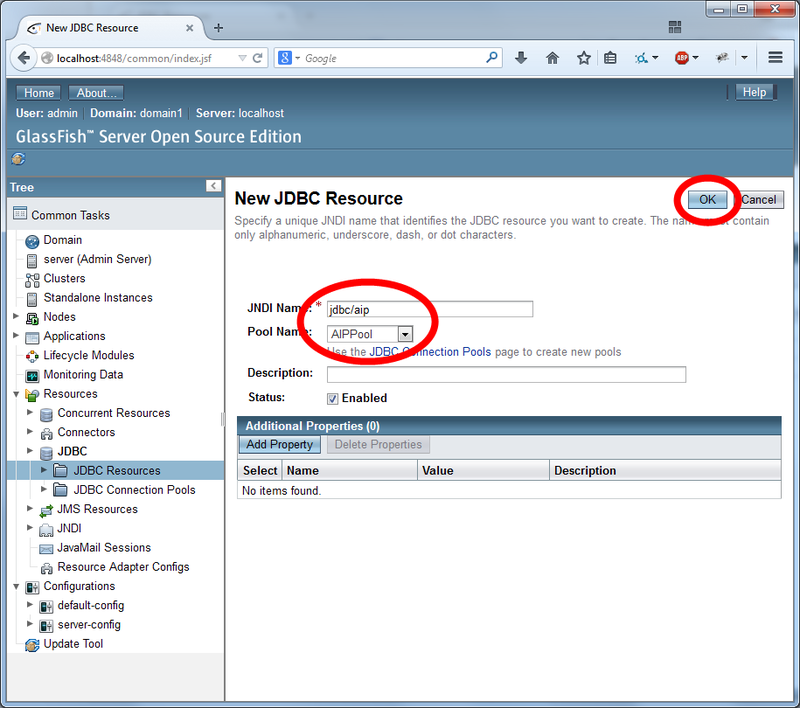 Create a new JDBC resource. 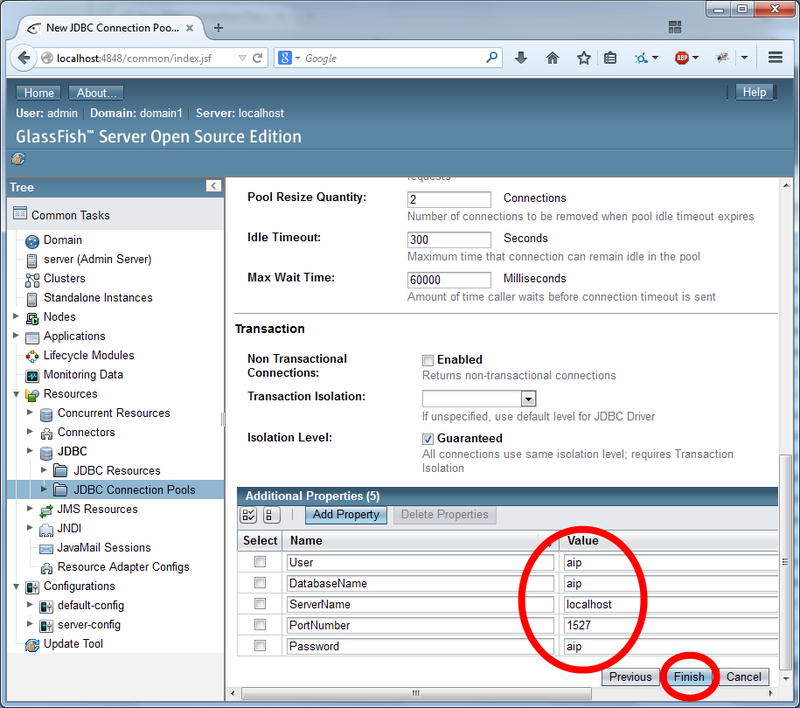 Use "jdbc/aip" (without the quotes) as the JNDI Name. Select AIPPool as the Pool Name. Now, modify your Java code so that it uses the JNDI resource. In this activity, you will create a Data Access Object. Implement the DTO as a simple Java Bean which has properties (i.e., get and set methods) corresponding to each attribute in your account table. Implement a DAO to create and store and retrieve data from the database. All of your SQL code should be inside the DAO. You might use the ArrayList in the findAll() method of your DAO. Update the command in your AccountController to use the DAO instead of JDBC. Finally, you can now show the accounts on the JavaServer Faces page, rather than in the server log. You can look at your solution from Week 4. The class WaitingListDatabase is similar to a DAO (except that WaitingListDatabase used static methods and you should use instance methods on a DAO). At the end of the previous exercise, you created a simple tabular view of accounts in the system. That might be used by an administrator to see the accounts in the system. In this exercise, we will now create a login form that uses the database. First create a JSF page named login (i.e., login.xhtml), and a page named welcome (i.e., welcome.xhtml). We will continue using the AccountController class as our backing bean. Now, create a login form using JSF and implement the login method so that if a correct username/password is entered, the user is directed to the welcome page. In your JSF page you could use h:inputText (for the username), h:inputSecret (for the password) and h:commandButton (for the action). Use the DAO to retrieve an instance of the DTO that corresponds to the user (search by username). Check the password is correct. Redirect to "welcome" if the login is successful. Comparing Strings using == does not always work (more information). Use a <h:messages/> tag on your login.xhtml file to tell JSF where in the HTML the error message should be displayed. You have implemented your own login system. Unfortunately, it isn't particularly secure. A user could simply guess "welcome.xhtml" to bypass the password. You could improve the security by adding additional checks on each JSF page (e.g., using a <f:viewAction> to authenticate the user on each request). A better approach is to use container-managed security. Container-managed security is a feature of the application server. It looks after logins and ensures that secure pages can only be accessed by authenticated users. A JDBCRealm can be used to do user authentication via a database. Configuration is a tedious process but not difficult. A user table, with a username column and a password column. The table is used to look up the user's password by username. A group table, with a username column and a group name column. The table is used to find all the groups for a given username. If you already have two tables that contain this information, you can use them directly. For greater flexibility, you can also define database views for the JDBCRealm. The jdbcrealm_group is a simple view that associates every username with a group called "Users". The JDBC Realm is configured in the GlassFish Server Administration Console. 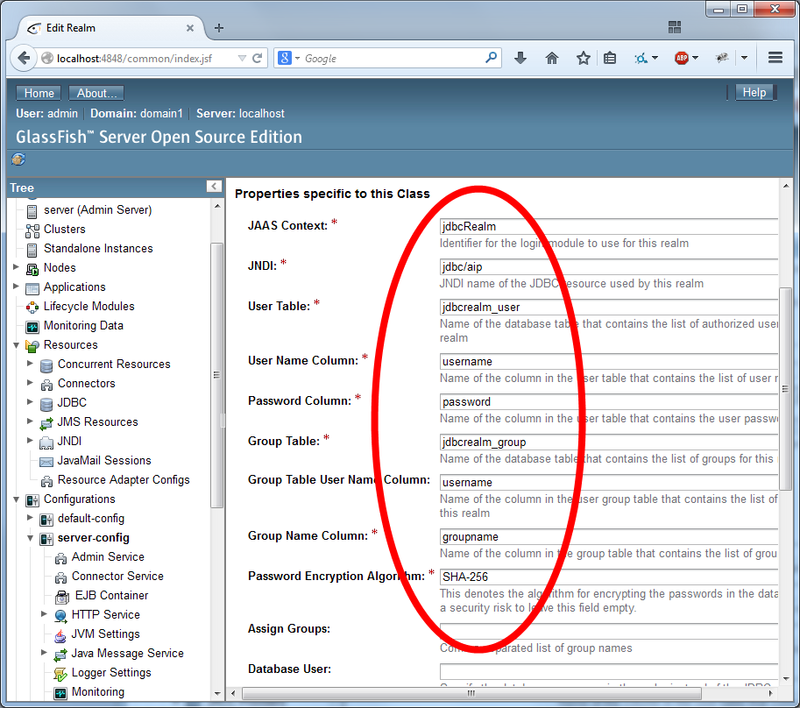 Navigate to the "Configurations/server-config/Security/Realms" section of the menu. Create a new realm. Name the realm "aipRealm" (without the quotes) and use the class name com.sun.enterprise.security.auth.realm.jdbc.JDBCRealm. Then scroll down. 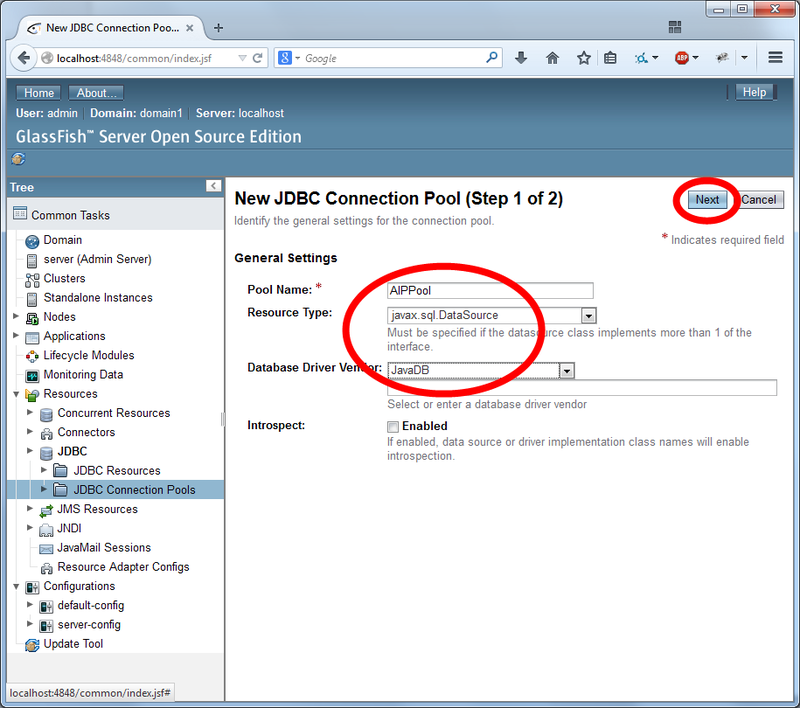 Next, you need to configure your Week5 project to use the JDBC Realm. First, add a new file of type "GlassFish Descriptor" from the category "GlassFish". Use the default name and file location. If an error occurs while creating the file, you can ignore it. This tag tells GlassFish to map the group of users named "Users" into a role named "Users". The first tag, <login-config>, tells GlassFish that login should use a HTML form (rather than browser-based authentication). It also configures the page that users are redirected to if they need to log in. 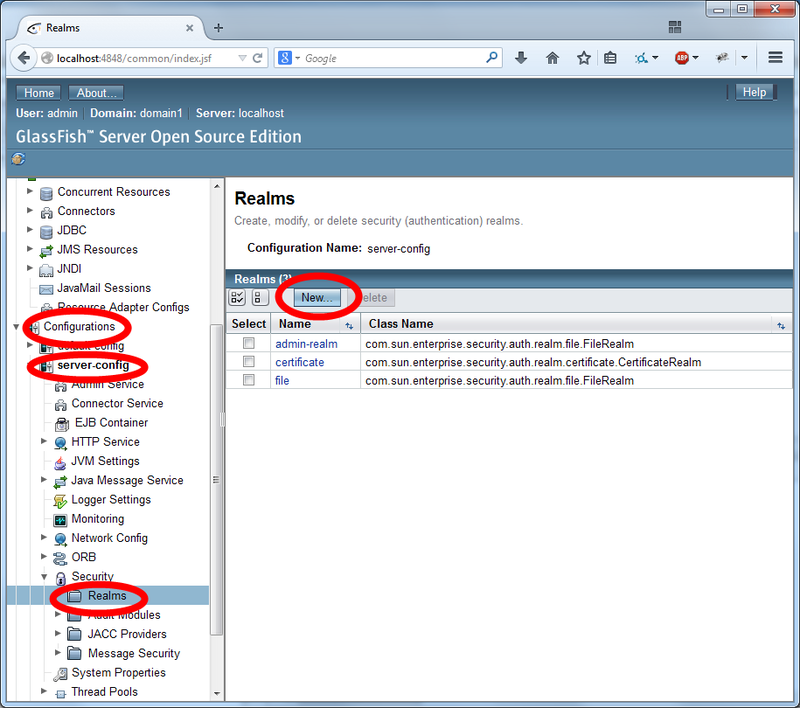 The <security-constraint> tag is used to tell GlassFish which resources can be used by which users (roles). We have secured welcome.xhtml and everything in the /secret/ directory. The <security-role> tag declares the names of the roles that will be used by the application. After modifying the source of the XML file, save the file. Then you can switch to the Security tab on the XML editor. The Security tab provides a visual way of configuring the same settings (but be careful, sometimes it can be buggy so it always pays to double check the generated XML). Now, run your application once again. Attempt to access the welcome.xhtml page directly. You should be redirected back to the login.xhtml page. You can now use the container-based authentication to replace your hand-created login code. You can get the container to do authentication by calling login on the HttpServletRequest. Modify your login code to use container-based authentication. When you first test your code, it will find that it does not accept any passwords. This is a security feature of GlassFish. 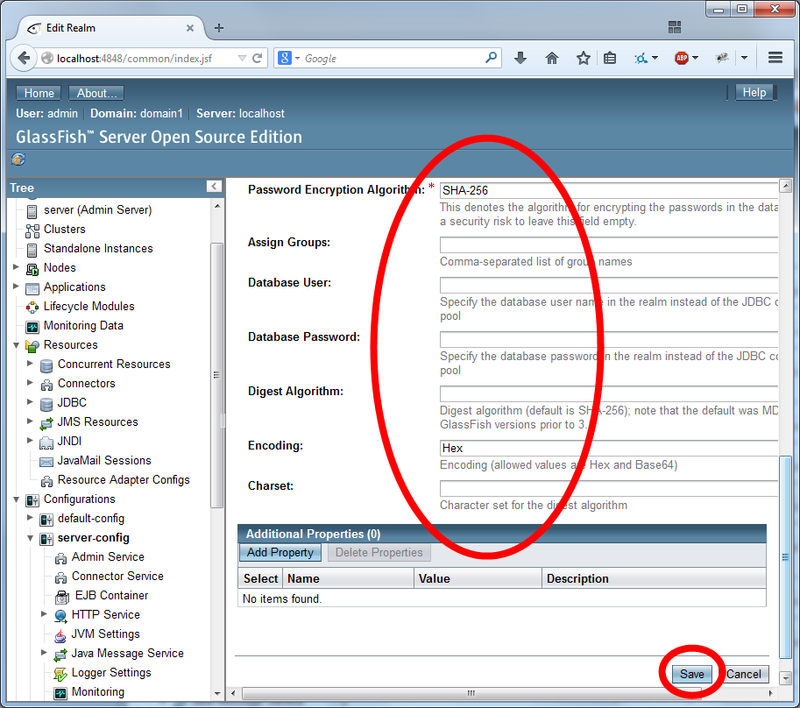 GlassFish does not allow you to store passwords in plain text in the database. In fact, it is generally considered bad practice to store passwords in plain text in any application. Instead, passwords should be encrypted. To get container-managed encryption to work, you should update your database tables. You should manually encrypt each password and save it in the account database table. For example, the password "qwerty" is encrypted to "65e84be33532fb784c48129675f9eff3a682b27168c0ea744b2cf58ee02337c5". The next stage in working with authentication is to write a form to create an account. When you save the new account, it should encrypts the password that it stores in the database. Add methods to your DAO to create an account. 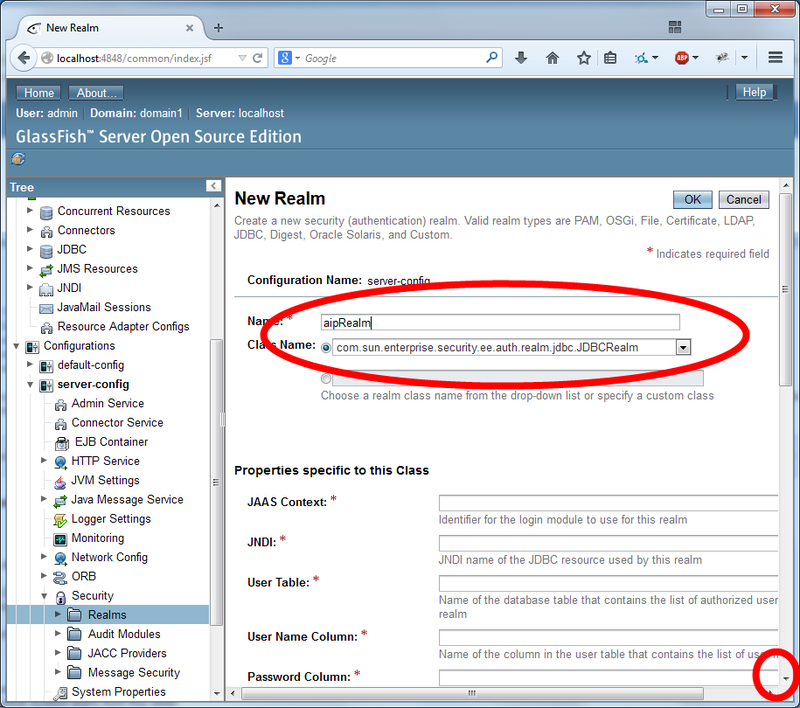 Create a JSF form for creating an account. Use the JSF form to create a DTO, encrypt the password and save it in the database.